Good enough parents cringe at the thought their child might feel the soul searing heat of shame. But shame cannot be stopped and serves useful purposes. IMAGE Found on Ennegram – Explore Your True Self Website. Most of us can laugh at this cartoon, but it probably also triggers memories of one or another shameful event from our childhood. Shame is common. Sadly, it often burns people and children beyond reason. Jerome Kagan, top researcher into how children grow, claims shame keeps us from the sin of Cain. He notes that the scorching flames of shame develop in children around the age of two. That is when younger siblings begin messing with their older siblings’ toys and possessions, creating in older siblings the desire to maim and murder. Most parents do a fairly good job of helping all kids step back from this type of behavior. Kagan also notes that shame also gets attached to feeling like a failure. I have battled shame most of my life because of dysgraphia, and dyscalculia. Both meant I endured hours of shame because I could not easily spell correctly, punctuate, remember grammar rules, or do simple sums. All of my classmates seemed to do so easily, or all in my class did. The shame of my hours at the black board trying to so what I could means shame’s fire may dim for me, but is also always ready to reignite and turn my cheeks read. How did I become a published author, particularly given my dysgraphia? Love of reading which lead to wanting to be a writer, parents who encouraged learning, not test scores; teachers who looked past the errors to the content; an inborn stubbornness; and finally, the advent of word processing and the computer with it’s little red lines helping someone like me spot the majority of my errors. Shame makes you want to sink through the floor or otherwise run and hide. The following tips consistently applied work to defeat shame’s fire and keep it from burning your children. Tip one: Making sure your child is not doing the unforgivable. This can start early which is why young children need to be supervised and stopped if hurting another child or animal. Parents of physically strong or bold children need to be particularly alert to how their child treats other children. Bullying can become ingrained in a child who has the power to force his or her way on younger, weaker, or less assertive children. Parental correction moderates the inborn desire to get your own way. Think of the shame attached to gay or homosexual identity which is not chosen. Tip three: Emphasize trying over succeeding and in terms of sports and other competitive venues fun over winning. Tip four: Recognize that all people come with strengths, talents, as well as weaknesses. Support strengths and talents. Accept weakness as part of life and something all people deal with. Tip five: Encourage practice of the 12 Easy Emotional Fitness Exercises. Start by learning and practice them yourself. Here’s a link to four easy ones. Many of today’s parenting gurus suggest parental criticisms are the source of shame. Many of these see punishment as abuse. Wrong, wrong, wrong. Legally, physical abuse is defined as adult behavior that does tissue damage to a child. Spanking that leaves marks or slaps that do the same can lead to abuse charges. Emotional abuse is a bit trickier, but essentially means unrelenting restriction, blame, and coldness. 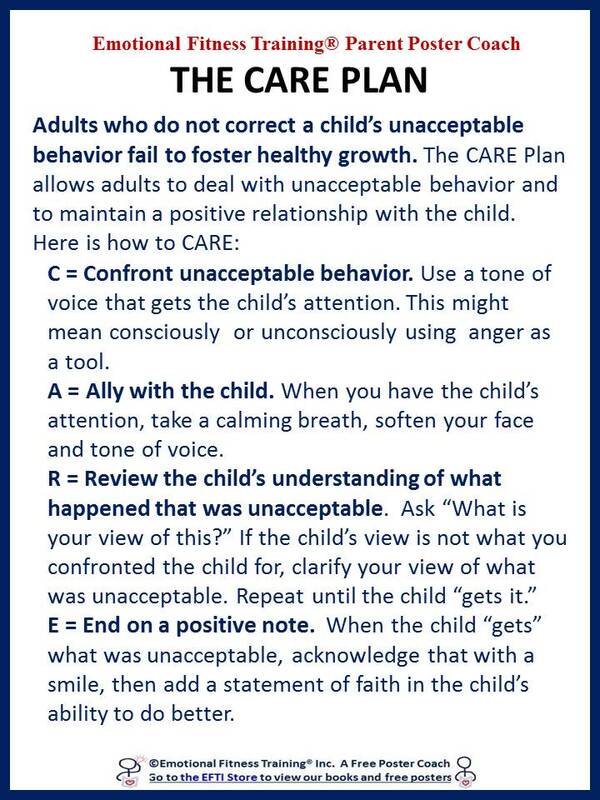 Failing to punish when needed to correct unacceptable behavior is classified legally as neglect. What to do? Worry about maintaining a caring relationship instead of fearing non abusive punishments. John Gottman, a leading researcher into marriage and divorce, developed the Five to One Rule. Five positive interactions for every negative interactions equals a good relationship. See today’s Free Poster Coach for a disciplinary tool called The Caring Response. This tool ends all punishments on a positive note. It also restoresgood feelings when punishment or discipline creates painful feelings in a child – it always does. I hope if you find my posts of value, you will practice internet kindness by liking, rating, commenting, or sharing. Thank you for all you do and as always work to stay strong, not always easy, but definitely possible. This post was inspired by this Word Press Daily Prompt Unsafe Containers: Which emotion(s) — joy, envy, rage, pity, or something else — do you find to be the hardest to contain? I think most people would agree: Shame is a big one. This entry was posted in Emotional Fitness (Emotional Intelligence) Tips, Parenting Issues and tagged Emotional fitness, Emotional Fitness Training, emotional intelligence, help for parents, how to parent, Katherine Gordy Levine, parenting, Parenting advice, Parents Are People Too, postaday, Shame. Bookmark the permalink.